"Macedonia": Why is a Name So Important? Ancient definitions of Macedonia compared with modern borders. This Sunday, Southeastern Europe's Republic of Macedonia is voting on a deal with Greece that includes changing its name to "Republic of North Macedonia". Greece objects to its neighbor using the name "Macedonia", and has been locked in a bitter dispute over it ever since the smaller country declared independence from Yugoslavia in 1991. 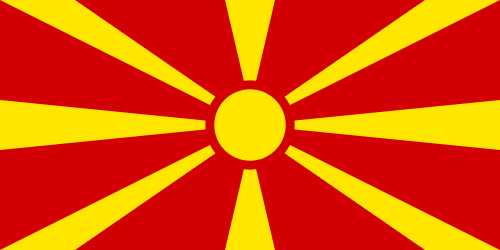 The spat is serious enough that the Republic of Macedonia has been forced to accept the temporary name "former Yugoslav Republic of Macedonia" (FYROM) in the UN and other international organizations for the past 25 years, and has been blocked entirely from joining the European Union and NATO, where Greece holds veto power on new member applications. Even now, with the official dispute almost resolved (assuming Sunday's referendum passes), many opponents in both countries are bitterly opposed to any compromise. To many Greeks, allowing the other country's people to keep calling themselves "Macedonians" is a travesty, and to many on the other side, switching to "North Macedonia" is a treasonous act of capitulation. The name "Macedonia" comes from the ancient Kingdom of Macedonia (also called Macedon), whose king Alexander the Great battled his way undefeated all the way from Europe to India in the 300s BC, briefly creating one of the ancient world's biggest empires. Modern Greece, a country whose national pride is built around its spectacular history, sees Alexander as a founding father. So when the new republic to its north declared independence as "Macedonia", many Greeks saw another country trying to steal credit for their treasured history. They were quick to point out that the new Republic of Macedonia didn't even speak Greek: Its national language, very similar to Bulgarian, was in the Slavic group, and more closely related to Russian or Polish than to Greek. Actually, linguists aren't sure if ancient Macedonia's spoken language was Greek either, but they are sure it wasn't Slavic. And though the Kingdom of Macedonia was located at the northern outskirts of the Greek cultural region, it definitely considered itself part of the Ancient Greek world. Greek was the sole written language there, and Alexander's family even claimed to be distant descendants of the mythical Hercules. As for Alexander himself, he was born in the ancient Macedonian capital of Pella, located within what's now Greece. 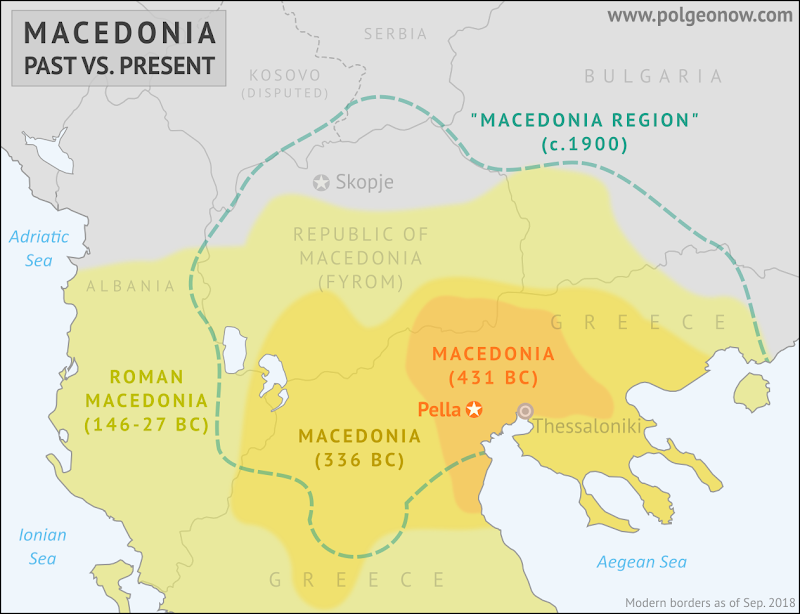 He may not ever have set foot in what's now the Republic of Macedonia, though by the time he took the throne in 336 BC his kingdom did include some southern parts of that country (see map above). Meanwhile, the vast majority of ancient Macedonia was within what's now Greece, and the Greek government still calls that region "Macedonia" today. Alexander went on to conquer various countries to the east, but his northern border never reached far enough north to include Skopje, the modern day Republic of Macedonia's capital city. Despite this, patriots in the Republic of Macedonia claim their own country is the heir to Alexander's legacy, even using his family symbol on their first national flag, building monuments to him, and naming their airport after him. These are some of the most important sticking points for Greece, which sees them as proof that its neighbors are trying to steal credit for Greek history. To those neighbors though, the story doesn't feel so simple. The people of the Republic of Macedonia didn't just wake up in the 1990s and decide out of the blue to name their country after an Ancient Greek kingdom. The tradition goes back a lot farther than that. After Greece was absorbed into the ancient Roman Empire, much of the region was placed into a "Macedonia" province, including more than half of what's now the "FYROM" (though the northernmost parts, including modern-day Skopje, were still in a different province). Through the Middle Ages, "Macedonian" identity was mostly forgotten by everyone, with the Byzantine Empire even assigning the name to a completely different region far to the east. But in the 1800s, when practically all of southeastern Europe was ruled by the Ottoman Empire of the Turks, independence-minded people started to talk again about a "Macedonian" identity. Only roughly based on the ancient Greek and Roman definitions of "Macedonia", the newly revived region included Skopje and surrounding areas as well as what's now northern Greece (see map above). The idea of a separate "Macedonia" caught on with time - mostly among Slavic people, but intellectuals imagined the country as one for all the peoples of the region, including Greeks. At that time, before the modern borders were drawn, there were Slavic people living throughout the so-called Macedonia region, mixed in with culturally Greek people (in fact, the oldest know Slavic writing came from the area of Thessaloniki, now the center of Greek Macedonia). Slavic languages had arrived in the area sometime during the middle ages, though it's not clear whether most Slavic-speakers were descended from immigrants, or whether their ancestors had been there already and just learned the languages. When the communist federation of Yugoslavia was formed out of Slavic-majority areas in Southeastern Europe after World War II, Macedonian nationalists finally got their validation, with a the southern end of Yugoslavia chartered as the "Socialist Republic of Macedonia". However, its proponents were all too aware that it only included the northernmost part of the "Macedonia region". Hoping to fix that, many in Yugoslavia began calling for northern Greece and southwestern Bulgaria to be absorbed into a "United Macedonia". Those sentiments still exist in some circles today, among Slavic people who feel they're only one part of a suppressed Macedonian nation. And while it's pretty hard to imagine the Republic of Macedonia invading Greece in the 21st Century, these rallying calls remain a sore spot for many Greeks. So Are Slavic "Macedonians" Real Macedonians, or Not? Many people in the Republic of Macedonia today believe that they're indeed descendants of the ancient Macedonians, despite Greeks often arguing that this is obviously false. After all, they speak Slavic languages, which didn't even arrive in the region until the Middle Ages, remember? Still, the truth could be a little more complex. As mentioned above, speaking Slavic languages doesn't necessarily mean that all of your ancestors arrived together with the first Slavic speakers. After all, no one assumes that Irish people or Native Americans trace their ancestry to England just because they speak English. Unless invaders exterminated the people who were living there before, most of a country's population probably has some ancestors who were there the whole time (and genetic research has proven this in many parts of the world). Instead of one people getting completely replaced by another, it probably happens more often that people end up learning the language of conquerors or new economic powers, as well as mixing with immigrants. So Slavic people in the area that was once ancient Macedonia may indeed have ancestors who were there the whole time. Now, we have to remember that most of the Republic of Macedonia wasn't part of ancient Macedonia, there may not be a good case for a direct line of descent from Alexander to the modern day "FYROM" - but with people moving around throughout history, they may not be completely unrelated either. In any case, most Slavic people who call themselves "Macedonian" have thought of themselves as Macedonians for their whole lives, in a tradition passed down from their parents or grandparents - so it's not something they can be easily convinced to just give up. What will happen in Sunday's referendum in the Republic of Macedonia? Stay tuned to PolGeoNow for more coverage!